Leaving Afghanistan is an emotional experience. It is such a unique place. And, by definition, the visitor is worn out , a little dirty and especially a few days before Christmas, homesick. Westerners were leaving in droves so all the systems were pressed to the hilt. Safi Airways did a surprisingly great job. 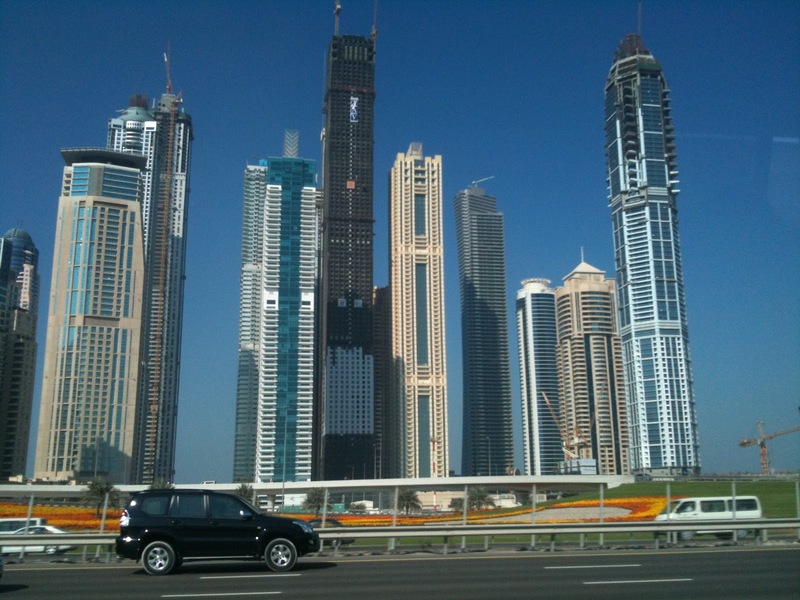 You have to decide to go through Frankfurt or Dubai. I chose Dubai and it was a great decision. 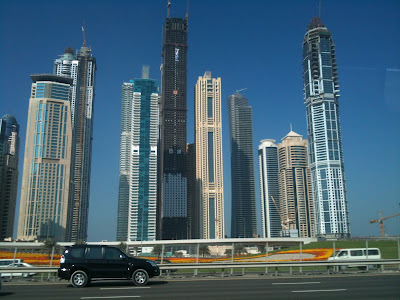 Flights were canceled all over Europe due to snow and Dubai is one of the most interesting places I have been. I paid for airport transfers as part of my deal at Le Royal Meridien. It is about a 25 minute drive so I figured the extra dollars were a break even. I had no idea that my airport shuttle would be in a showroom quality brand new BMW with driver and hostess who immediately handed me clean cold wet white hand towels. I wouldn't have been surprised if a plate of sushi had followed. Coming in at night I got a sense of the skyline(s) of Dubai. The hotel was great; on the beach, a bunch of pools and the best service I have encountered. Side note on fancy places. Dubai is home to the hotel reputed to be the most luxurious in the world. Since I am not getting any younger and don't anticipate being a regular visitor, I figured, "Perche no"? The answer to that question was cheapest room = $6,000. per night. I demurred. Saving over $5700 a night and receiving more luxury than I could imagine worked for me. Coming directly from Kabul, Lower Satva (at Doe Bay Resort and Retreat) would have seemed like a Four Seasons. 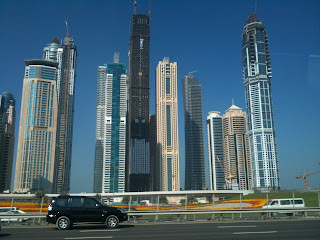 The Dubai story is all about the architecture. The entire city appears to have been built within the last decade and a half and money doesn't seem to have been a limiting factor. And, notwithstanding the financial problems facing the Sheikdom, there were more tower cranes (by my estimate, nearly one hundred) than I have ever seen. We thought we (in Seattle) got carried away with development during the boom, but this eclipses our excesses by a longshot. I was lucky to have lived in New York in the late 70's and to have eaten a few meals at Windows on the World in the World Trade Center, then the tallest building(s) in the world. Since that is now a lifetime experience, I have always felt lucky to have experienced it. So, Dubai is now home to Burj Khalifa, the tallest building in the world. It opened in January. Did I mention that I am a little afraid of heights? I am. But I know it is an irrational fear so I decided that I had to go to the top of Burj Khalifa. I went to the Dubai mall which was the nicest mall I had ever seen; even nicer than Southcenter. I had a few hours so I stalled. Finally I went outside and saw the building..... My jaw dropped. I looked away and looked back and my jaw dropped again. It is bigger than life. Oz came to mind. I laughed and said no bloody way am I going up to the top. It is so high, I couldn't really see the top and it was impossible to photograph in a single frame. Side story about Bhutan, the Tiger's Nest and heights. 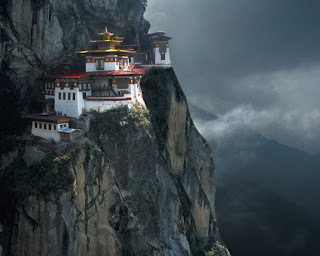 I remembered climbing up to Tiger's Nest in Bhutan with my daughter Megan just a few years ago. I had been sick and was a little lightheaded and said, "Megan I don't really want to continue doing this." She said, "Dad you will be so mad at yourself if you stop." I was almost coinvinced. The trail has huge dropoffs, is carved into the rock and needless to say, no guardrails. Then a somewhat roundish Buddhist nun came along in her robe and fliplops more or less skipping back from the top so I persevered and have never regretted it. 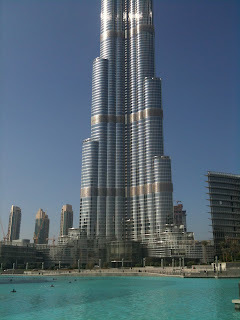 Was I about to get this close to the tallest building in the world and not go for it? No way. The Mall is a big distraction by the way, so it was easy to keep stalling. Check out this fountain. I vaguely remembered a space available ticket. I went to the cashier and asked the charming Dubai salesgirl. "We only have VIP last minute tickets," she replied. A ticket is 100 UAE Dirhams. That is about $27.00. A last minute ticket is 400 Dirhams. You do the math. Dilemma #2. That is a rip. I will not take more space than I would for 100 Dirhams; BUT, Was I really willing to miss out to save $75. that my kids would probably inherit which would only screw them up? "I'll take a VIP ticket." So now I was doing something I only half wanted to do and I was paying twice what everyone else paid. (I felt like I did at the Kabul Zoo when I paid $2. for a 20 cent ticket the previous week.) The rest of the experience was cool. The tube ride to the elevators had some really cool videos. The elevator went 120 plus stories non-stop. The views were incredible. 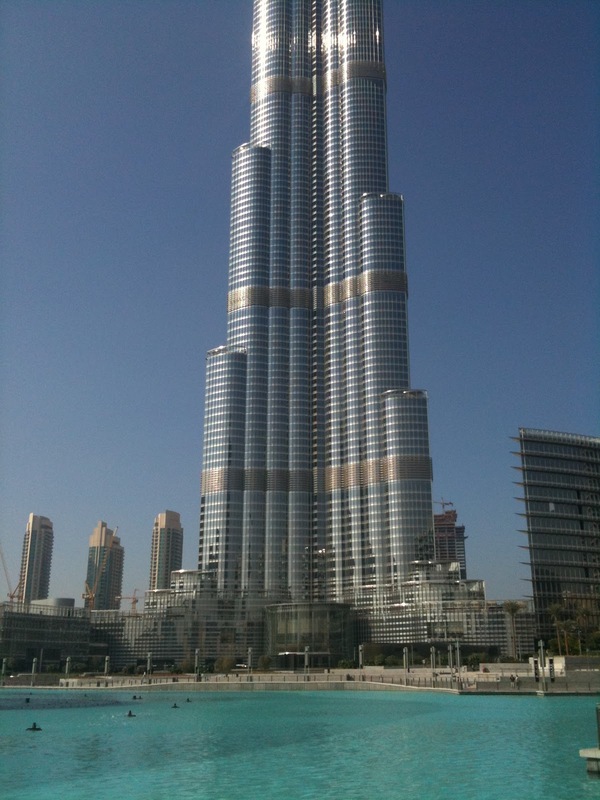 A couple last thoughts on Burj Khalifa: There was a pane of glass that was missing. They roped it off with those ribbon deals they use at the airport to keep people in a straight line. There was a piece of plywood where the glass used to be. This did not instill confidence. There is an outside deck at this level so I had to go out there. It was pretty cool but the scariest thing was going out there and then looking up. There is basically another 45 story building above you. I was dizzy. I met a couple guys from Greece (MD's early in their careers) at the club in le Meridien. They were eally nice guys, with whom I shared a few drinks, a few meals and some rather brilliant conversations. I also swam in the Persian gulf which was perfect. The weather was also perfect! I love your stories and photos... I'm sitting here in a high rise (17th floor, seems shrimpy in comparison to your Dubai building) in a very rainy downtown Seattle, but in my mind I'm in Dubai and Kabul! Thanks for the entertainment and safe journey home.